The ability to extract water from wells quickly in very large quantities with minimum effort. The most common wells of this type are known as "Delou wells". Delou is a word of Arab origin, meaning a pouch, usually made of leather, used to draw water. These wells have been used since the Mesopotamia period and are a derivative of the "chadouf" counterweight water draw-off system mainly used in Egypt. This method is now mostly used in Tunisia, Libya, Morocco, Mauritania and sub-Saharan Africa. Although well names and certain details such as the shape of the goatskin used to lift the water, may vary from one region to another, the principle remains essentially the same. Delou wells are commonly used by farmers as they can extract the large quantities of water needed for the irrigation of crops more easily as they operate through animal power provided by an ox, a camel or, more rarely, a donkey. This method primarily relates to farmers who have a high water consumption in arid countries. It cannot be used for drinking or food preparation as the water is often contaminated and thus unsuitable for direct human consumption, unlike water extract using a hand pump. The two main causes of contamination of Delou wells are the fact they are open and the goatskin used to extract the water may drag on the ground. 5) What does the Delou method involve ? How is it used ? The Tekarkart well of the Nigerian Tuaregs, consists of a well as such and a wooden structure. The wooden scaffolding consists of a framework erected obliquely relative to the ground and supported by two props acutely inclined in opposite directions (idaren in Tuareg). 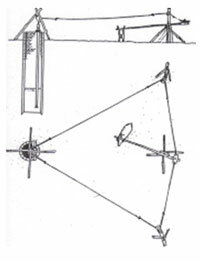 The large frame comprises two main uprights supporting the pulleys and providing the well frame (taghmawin) and a small frame to which the pulley is attached. 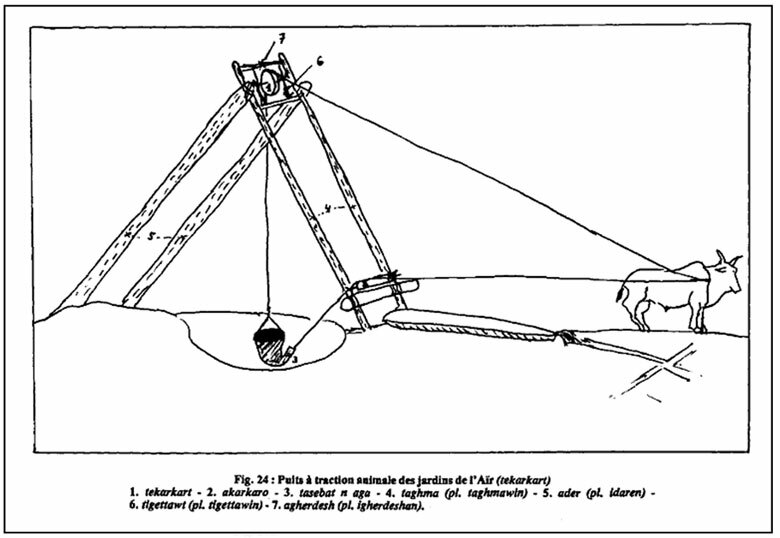 The traction animal is connected to the water dipper by two ropes : one that raises the goatskin, sliding on the pulley circular groove, and the other holding the neck raised, sliding on a wooden cylindrical pulley the shaft of which is seated on two small forks attached to a thick lower horizontal beam. The two pulleys supporting the two ropes pulled by the animal were referred to using the same term, one conjugated with the female gender and the other with the male gender : tekarkart and akarkaro.There are two types of water dippers : the gardener type which is open at both ends (tasebat n aga) and the farmer type who only has one opening. Once the animal is reached the end of its tow path, the length of which depends directly on the well depth (8 to 50 metres), it has raised the water dipper above a receptacle. The worker then only has to pull on the bottom rope to release the dipper neck and pour its contents. The receptacle may be a small reservoir or pipe splitting into several secondary branches taking the water to the land to be irrigated. 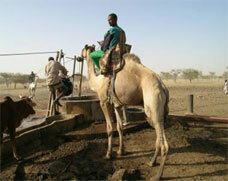 The Delou Sahelian well takes its name from the approximately 40-litre goatskin used to raise the water. A rope connects the Delou well to the animal that is fitted with a saddle and a cinched girth strap. 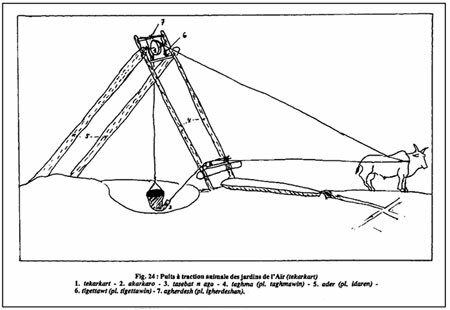 The tow rope is attached to the side of the animal at rib height and is passed over a wooden pulley whose shaft is supported by a wooden fork. This support is inclined towards the centre of the well, which reduces the Delou’s friction on the well’s walls during raising. For a 40-metre deep well, the estimated water extraction time is 6 minutes for a 40-litre Delou, to which a time for handling the Delou on the surface has to be added as this system, unlike the one previously presented, does not have an automatic drain. This handling time is relatively long (3 to 4 minutes) and tiresome. With a well 140 cm in diameter, up to four hitched up animals can be made to work at the same time. The main advantage of these wells is their very high flow rate and the fact that they require little work on the part of man. In comparison with a hand pump, which rarely delivers more than 1 m3 per day, a Delou well provides between 20 and 30 m3/day. The main drawbacks are due to the fact that the well is open, making for a significant risk of water contamination or people falling into it, and that animals have to be replaced every month if they are used exclusively for this task all day long. The building cost is very low since the well can be fully built with locally available resources and with little equipment ; only the pulley itself is the work of skilled craftsmen. Maintenance costs are essentially related to costs of maintaining the traction animal. 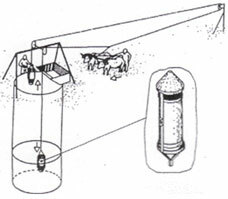 A system for extracting water through a mechanism driven by donkeys had been developed but its widespread adoption was limited due to its relatively high cost and the fact that it was less efficient than the Delou well. A control system driven by an animal moving around a circular path can also be fitted to a hand pump. Originally designed by hydraulic department in Senegal, this water extraction system is usually driven by a pair of oxen, or more rarely donkeys. Two pails are each connected at one end of the same pulley-mounted overhead cable part of which is horizontal. One pail is raised while the other is lowered by the animals pulling on the cable each time they complete to a to and fro path. 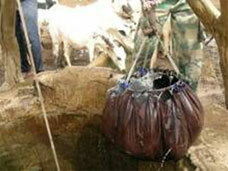 This ingenious system requires two people, one to empty the pails and the other to lead the hitched up animals. Its cost, however, limited its widespread adoption. - It has less risk of water contamination than the Delou well. - The working time of animals should be limited to 3 or 4 hours/day. - The cost is higher : an investment of about €700 to €1800 with oxen and about €200 to €400 with donkeys (maintenance costs of about €150 and €80/year respectively). - A community-based way of managing the animals usually needs to be set up to reduce costs. - The need to have a well with a high flow rate at all times limits its adoption possibilities. These walking wheels, named after their inventor and used in Burkina Faso and in Senegal in particular, are less common. They are powered by a donkey walking around a windlass a few metres from the well thereby operating, through a cable and pulley hoist system, the pistons of two long-stroke pumps driven in opposition. With each turn of the wheel, the force required from the donkey passes twice through a maximum force and twice through a zero force, allowing the efforts made by the animal to be paced thereby reducing its fatigue. - Fewer risks of contamination as well. - Good flow rate : 2 to 3 m3 down to a depth of 10m depending on the donkey’s strength. - Can be operated by one person. - The power developed by an animal moving in a circle is less than half that developed when it moves in a straight line (due to the high frictional forces in the mechanisms). Although this can be improved with a gear system, it’s more expensive. E36 – Advantages and disadvantages of hand pumps. How to select and maintain them?